Constitutional problem? Who ya gonna call? The United States Constitution is important as the statement of principles that restrain the things that the government can do. While we think of the Constitution as the document granting basic rights–to keep and bear arms and to express ourselves–the Constitution, primarily through the Bill of Rights and the Fourteenth Amendment, functions by restraining the government from taking our property without due process, from quartering soldiers in our homes, from punishing us for conduct that was legal when we did it, and from unreasonable searches and seizures, among other things. Constitutional protections are implemented through procedures followed by courts. Associate circuit courts in Missouri are where persons accused of crimes are arraigned, which means that the government has to formally charge them with specific crimes, rather than simply holding them. Reasonable bail is set by judges, with the accused having a right to counsel. Creditors are restrained from taking the property of defaulting debtors until the creditors obtain judgments. Property given by the debtor as collateral for a loan is not covered by the constitutional restriction against pre-judgment attachment. 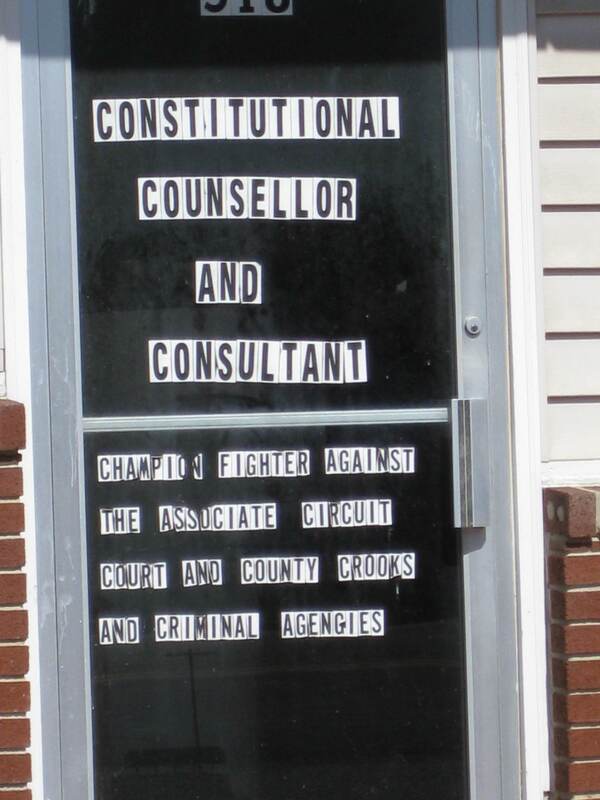 The constitutional consultant and counselor who posted this sign on a door on Main Street in Golden City, Missouri, probably didn’t get the result he or she had hoped for in an experience with the associate circuit court, but it’s very significant that most of us feel confident that the procedure that the court followed was consistent with the United States Constitution. Posted in Missouri, Ozarks economy. Bookmark the permalink.